The International Monetary Fund (IMF) has commended the new strategy of Sri Lankan Government to create financial discipline and lead the country in a correct path to economic development. Managing Director of the International Monetary Fund Christine Lagarde said she highly values the Sri Lankan Government’s dedication to take the country to economic prosperity when she met with the Prime Minister Ranil Wickremesinghe and the Sri Lankan delegation at the World Economic Forum at Davos, Switzerland. 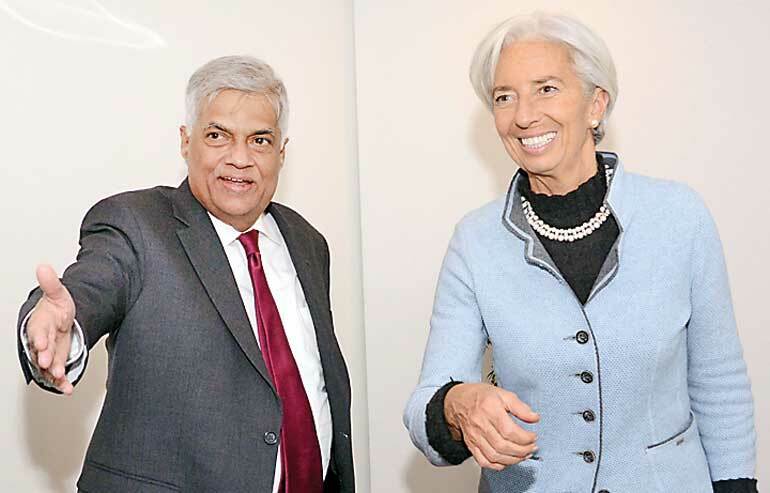 During discussion, Lagarde noted that the Sri Lankan Government has exhibited a great deal of commitment in this regard. Prime Minister Ranil Wickremesinghe said that Sri Lanka had to face unexpected challenges in carrying forward the operations to rejuvenate the island’s economy. He noted the difficulties the country had to face in achieving the expected economic growth, especially in the agriculture sector, as a result of the prevailing drought, the worst in fifteen years. The Premier stated that such climatic changes dent the economic progress of the island nation. Finance Minister Ravi Karunanayake said that they were estimating the impact on the Sri Lankan economy following the prevailing drought. The Premier also met Minister of Transport and Highways of India Nitin Gadkari and Chief Minister of Andhra Pradesh Chandrababu Naidu in Davos. The discussion with the Indian Transport Minister focuses on obtaining support of the Indian Government to improve road network of Sri Lanka. They also paid attention on improving economic and trade ties between Sri Lanka and the Andhra Pradesh. Minister Gadkari and Chief Minister Naidu said that they are willing to support Sri Lanka and strengthen historical ties. Even if Sri Lanka regains the European Union’s GSP+ tariff concession, the Government will try to negotiate separate trade agreements with Britain when it leaves the European Union, Prime Minister Ranil Wickremesinghe has said. “If Britain is not in European Union, then we have to discuss about it (trade agreement),” the Premier told BBC during a television interview in Davos while attending the annual World Economic Forum last week. The Prime Minister said that the possibility of establishing improved economic relations among the Commonwealth Nations had already been discussed with New Zealand, and he also hopes to continue this discussion and exchange ideas with other leading actors. The Premier pointing out that the region spanning from South Africa to Indonesia will grow to be the largest - and strongest - middle class in the world by 2050, has stressed the importance of pre-planning for the food production of this group. During the course of the interview, the Prime Minister said the Asian Region was fast emerging as the primary economic region of the world and emphasised that the Hambantota Industrial Zones afforded any investor, in any country, the suitable environment within which to launch their enterprises. Speaking about the presidency, the Prime Minister said since President Maithripala Sirisena has not yet said anything about abolishing the Executive Presidency, he does not believe that the Sri Lanka Freedom Party’s position has changed. He also said that there were no trained police officers to investigate the serious allegations of fraud and corruption taken place during the previous regime, the Government had to send police officers abroad for training in such matters. In the interview with BBC, the Prime Minister alleged that the recent protests in Hambantota against the Chinese investments were launched by former president Mahinda Rajapaksa and his supporters and as a result there is a division among the former President’s supporters.